Regular Joe: Omni-GUBU - A Short History of Significant Utterences in Irish Politics. Omni-GUBU - A Short History of Significant Utterences in Irish Politics. *Some random thoughts on the lyrical bent & tendency towards catchphrases of Irish Politics. Off the top of my head. That infamous acronym is everywhere again. And no wonder. We are in the middle of what the great French diplomat and political theorist Tallyrand once characterised as; "A total feckin' shite-storm". One of those periodic National Traumas. Don't worry if you've missed it, there'll be another along in a while. Our state motto; "Omni-GUBU Ad Nauseum". Commissioner Callinan will ride off into the sunset wishing that he hadn't taken the perfectly innocent adjective "Disgusting" and turned it into his professional epitaph. 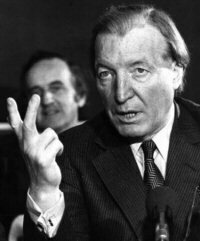 But it was Charles J Haughey's baroque response to another Irish scandal, the strange series of events (in the summer of 1982) which led to a double-murderer getting caught in the house of the Irish Attorney General, that is still our go-to phrase in times of crisis. GUBU! .....It was text-speak before anybody had heard of social media or smart-phones. The early '80s equivalent of "WTF JUST HAPPENED!?" 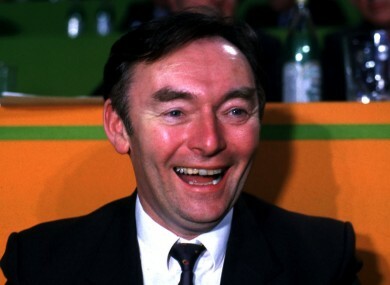 It wasn't Haughey himself who coined it - but he did provide the inspiration. Say what you like about Charles J (try "Corrupt"), the man had a way with words. When the news broke about on-the-run killer Malcolm McArthur hiding in the apartment of the State's top law official, Haughey spurred his metaphorical horse towards the heights of hyperbole. "It was a bizarre happening. An unprecedented situation, a grotesque situation, an almost unbelievable mischance." He said. It was Conor Cruise O'Brien who compressed Charley's thoughts and coined the phrase; GUBU - for Grotesque, Unprecedented, Bizarre, Unbelievable. And as a handy acronym for describing how our Dysfunctional Republic works, it has never been bettered. Probably never will. A small scandal breaks - usually by accident - and you can mentally picture the great and the good, the journos who cover them and the public who look on, putting on their tin-hats and bracing for far worse to come. If there's one thing you can count on with an Irish political scandal, the first plop is always only the muted harbinger of several tonnes of shite about to hit the fan. Unprecedented and Bizarre? Sure you haven't been paying attention, Make yourself some popcorn 'cos this is about to get EPIC! It is a small island. And if somebody's been naughty, the chances are he has had the help, connivence or blind-eye of a few others. Who are usually well-connected to the people at the top. Or they are the people at the top. So it's a good thing, then, that our politicians have a peculiarly Irish talent for minting a memorable phrase. Sure, the Yanks with their "I did not have sexual relations with that woman!" or "Read My Lips - No New Taxes" are also good at this sort of thing. But it takes an Irishman (or woman) to add a bit of poetry or drama. Or to bend words so that they sorta/kinda deal with the scandal or crisis, but also put them into the proper perspective. Smooth the events out a bit, point out that nobody is really at fault here, these are events beyond our control. That money was only resting in my account. Politicians in other countries, when caught out, may try to spin or explain. In Ireland, they rail against cruel fate! Damn the stars that brought them to this sorry pass! They get dramatic, sentimental or lachrymose. They appeal to the plain people of Ireland (yes, those feckers). Brian Lenihan Snr, on the main evening news, looking a beaten man, trying to explain away being caught out in a lie by turning to "Mature recollection". Looking back now, knowing how sick the man was and how he had been (unknown to himself) betrayed by his great friend, it is a very sad moment. Another Fianna Failer, Gerry Collins, down on his knees, begging Albert Reynolds (who was out to topple his boss Haughey ) not to "bursht up the party!" Again, on the main evening news (which gets very Oprah more times than you would think reasonable). It's not always hi-flown or tearful. Sometimes our politicians like to employ playful threat, such as when a Garda who was trying to intervene in a late-night drinking session involving politicians was asked; "You would like a pint or a transfer?" The language our politicians use can be very revealing. Coalitions are "temporary little arrangements" - exasperated party leaders talk about "the f******g Peace Process". Or it can be smug. Pee Flynn inviting the Late Late Show audience to try running three homes on an MEP's salary - "I wanna tell you, it ain't easy! You try it sometime!" That was great TV - watching an odious creature like Flynn dig his own grave with those big shiny horse-teeth. Charles J Haughey (again) telling an Austerity Hit Ireland (of another time) that we were "Living away beyond our means"...this from the Lord of the Manor in the Charvet Shirt. Living large on "political donations" and telling his bank, who had been trying to get back a 1 mill "loan" for years, to basically sing for it. Gogarty;"Will we be getting a receipt?" Boss (with a rueful laugh): "Will We F**k!" That remains the perfect Irish political vignette. The honest, hard-working bean-counter (god bless his innocence) and the developer who knew how things actually worked. Will things ever change? Will they F**K.